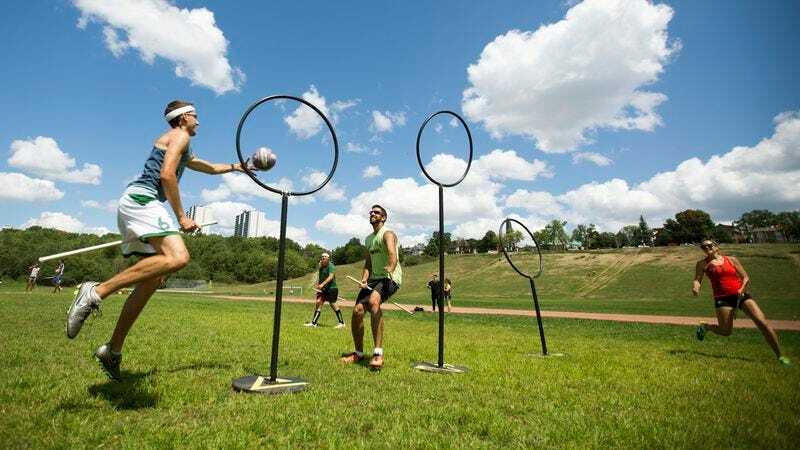 Since 2005, college students, Harry Potter fans, and alternative sportsfolk in general have been playing Quidditch, the real-world version of the beloved-if-largely-nonsensical broom sport from J.K. Rowling’s bestselling books. Now, Mashable reports that things in the Quidditch world are getting more organized, with English fans developing a new league meant to codify and legitimize the game. For those of you have never been dragged to a Quidditch game by a well-meaning friend or former acquaintance, it plays a little bit like Powerball from American Gladiators, except everybody is carrying a PVC broomstick between their legs. (Also, there’s no gender segregation, with the game being lauded as one of the most inclusive sports currently being played.) You can read the current rulebook—now on its tenth revision—over here, the better to know the difference between a snitch runner and a quaffle the next time the QPL comes to town.